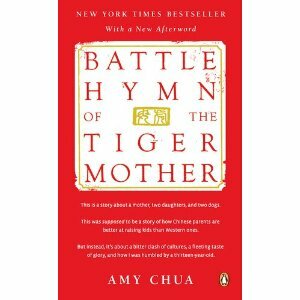 I didn't plan to read Battle Hymn of the Tiger Mother after the media frenzy ensued about the book. But I saw it at the library and it wasn't a long read. 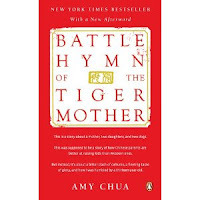 If your head has been buried in sand, you might not know that author Amy Chua write about rears her Chinese/Jewish daughters using traditional Chinese methods (her words, not mine). This means hours of music practice and Chinese practice after school, before school, on weekends and even on vacations (she booked hotel ballrooms from 6-8 a.m. so her daughter could practice piano on holiday, so she wouldn't get beat out by the competition from lack of practice). Chua does not come across as sympathetic at any point in the book, and I could hardly figure out what her husband sees in her, other than a hard-driving, mean person intent on making everyone's lives miserable as they exceed academically and musically. It did make me think about my own child-rearing philosophy, and made me realize that there's probably some middle ground (as long as I don't care if my children are musical virtuosos). Probably I do need to push them harder and make them study more, but she didn't make the Chinese method seem like something I'd want to do. Certainly the model is not unique, and living in the Bay Area, there are many who follow her philosophy (not all of them Chinese), and it does seem to work in raising kids who are intelligent, ambitious and excel in many areas. But it's not something I could do. If nothing else, it sheds light from an inside perspective of what it's like to be raised in that environment. Mary Poppins Trivia - Win Tickets!